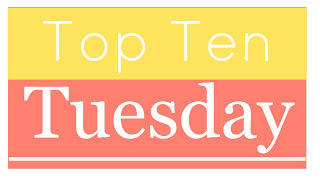 Top Ten Tuesday is hosted by The Broke and the Bookish and The Artsy Reader Girl. 1. The Gathering by Kelley Armstrong - Canada! 2. Clockwork Angel by Cassandra Clare - England! 3. Strange and Ever After by Susan Dennard - Egypt! 4. Carrier of the Mark by Leigh Fallon - Ireland! 5. Just One Day/Just One Year by Gayle Forman - So many places! 6. Ruby Red by Kerstin Gier - England! 7. All That Glows by Ryan Graudin - More England! 8. Wolf by Wolf by Ryan Graudin - Germany, Russia, Japan, and more! 9. My Lady Jane by Jodi Meadows, Cynthia Hand, and Brodi Ashton - Ye olde England! 10. The Name of the Star by Maureen Johnson - England yet again!